It’s exciting to know you’re going to be bringing a new member into the family. Decorating the baby’s nursery, buying children’s books and finding that perfect stroller are all important. But, what’s more important is whether you’re ready for the financial costs that come with having a baby. Both pregnancy and birth require a lot of medical attention. In other words, you won’t be charged for the birth alone. The pregnancy itself is filled with costs that accompany the numerous doctor’s visits, tests and procedures you may have. Therefore, you’ll want to make sure you have enough financial cushion before you decide to have a child. If you’re preparing to grow your family, you may want to consider enlisting the services of a financial advisor. The right financial advisor can help you with all your financial planning needs from college savings to retirement. The costs of having a baby include more than just the actual childbirth. These costs also include the regular check-ups, tests and prenatal care associated with pregnancy. The average price of having a baby, through vaginal delivery, is between $5,000 – $11,000 in most states, according to data collected by Fair Health. These prices include the total duration of care, the obstetrician’s fee (including prenatal care), the anesthesiologist’s fee and the hospital care fee. Additionally, the average costs for a Cesarean or C-section birth range from $7,500 – $14,500. Complications during birth, however, for a vaginal or C-section delivery will increase the charges for childbirth. Although we’ve listed the average costs of having a baby in the U.S., it’s important to note that these costs vary for each state. Key factors that influence the final costs of childbirth include the state and its cost of living, the type of birth delivery and whether or not the patient has health insurance. While the exact costs of childbirth range anywhere in between $4,000 – $20,000, we’ll look at the two states with the highest and lowest childbirth costs. The cost of a vaginal delivery with insurance in Alaska is $10,681, whereas the costs without insurance total at $19,775, according to Fair Health data. The state with the lowest childbirth costs is Alabama. In Alabama, a vaginal delivery with insurance costs $4,884. A delivery without insurance, however, costs $9,013. C-section deliveries, with or without insurance, for each state enhance your final costs significantly. Federal law mandates that pregnancy and maternity care are covered in health insurance plans. This requirement, however, contains two key exceptions. The first is that you’re allowed to stay in your parents’ healthcare plan up until age 26. This doesn’t cover delivery and newborn care, but it covers pregnancy and maternity care. The other exception is that grandfathered health plans, or plans created on or before March 23, 2010, won’t guarantee pregnancy and maternity care. 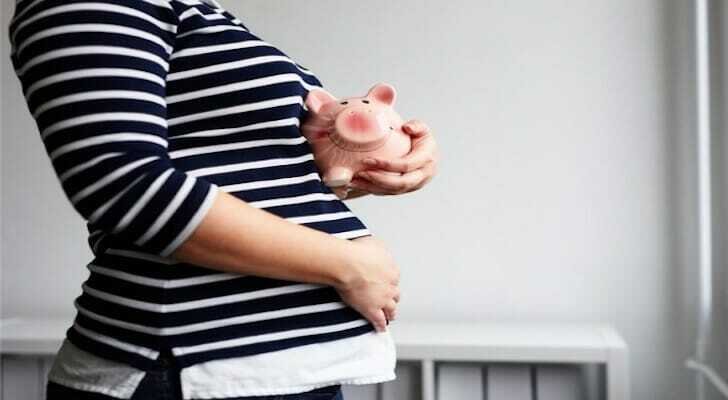 If you want to know how much of the pregnancy and childbirth costs your health insurance will cover, keep in mind that the deductibles, copays and coinsurance associated with your plan will affect the amount covered. Another factor that determines the amount of medical costs your plan covers is how much money you’ve paid toward your out-of-pocket spending limit for the health plan year. Finally, the amount of costs covered is affected by whether or not your plan’s provider network includes the hospitals and doctors you’re using. Though the process of having a child is one that requires a lot of preparation, you can get ahead of the game through a few different ways. For starters, try to find out how much the hospitals near you will cover under your health insurance. You can then compare hospitals to determine which one will help you significantly reduce medical costs. You can also save money by cutting back on unnecessary purchases. Furthermore, the more you cut back on buying things you don’t absolutely need, the more money you’ll have to dedicate toward childbirth medical costs. Overall, having a baby can be both a joyous and life-changing experience. It’s amazing to embrace your newborn with loving arms, but you don’t want to break the bank in the process. It’s important to remember the expenses that come with pregnancy and childbirth. In addition, keep in mind that complications during birth can increase those costs. Having a baby is both exciting and expensive, so make sure you’ve planned to have the most financially secure experience possible. A financial advisor can be key to helping you navigate life transitions like having a baby. SmartAsset’s financial advisor matching tool can help you find a financial advisor who suits your needs. You’ll start by answering a series of questions about your finances and then you’ll be matched with up to three advisors in your area. You can read the advisors’ profiles, interview them and determine which advisor to work with in the future. One of the ways to best prepare yourself for the costs of having a baby is making a budget. Write a list of your most important expenses and cut out other unnecessary purchases. In other words, separate the needs from the wants. Before you know it, you’ll have a bit of leftover money. Consider placing this extra money in a high-yield savings account that can help you make the most of your savings. These are the best savings accounts available in 2018. Rickie Houston Rickie Houston writes on a variety of personal finance topics for SmartAsset. His expertise includes retirement and banking. Rickie is currently studying journalism at the Boston University. Rickie’s contributed to work published in the Boston Globe and has worked alongside award-winning faculty for the New England Center of Investigative Reporting at Boston University. He’s involved in multiple publications on campus, including Boston University News Service and Verge Campus BU. Rickie enjoys playing the guitar, traveling abroad and discovering new music. He is originally from Wilmington, North Carolina.